Bow and side view of 'P.S. Ruby' (II), with P.S. 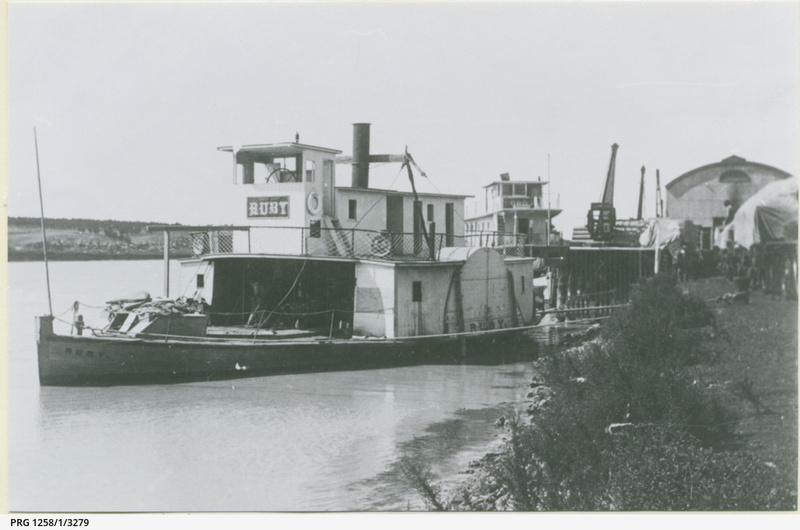 Corowa at rear, tied to river bank, according to Harry Godson, at Morgan, just above the wharf. A researcher is sure this is incorrect as there are no cliffs at this point on the other side of the river at Morgan, and the wharf and buildings are also wrong for a Morgan location. [from information supplied]. This photograph was dated and location identified by R. Parsons. According to researcher F. Tucker, this photo was taken at the Murray Bridge wharf. Registered at Sydney, 1877, Port Adelaide, 1884, official number 74898. Built at Moama, 1876, by G.B. Ayr. (Godson number not identified).